Are you always bemoaning how close you came to creating winning combinations that are worth a fortune and feel like you don’t get the rub of the green that you deserve? If that sounds like you, now is your opportunity to enjoy a spot of good fortune as you take possession of a Maneki-neko and Shisa which try to ensure that you leave the reels as a winner every time. You’ll find yourself entering a Japanese temple for another oriental experience at the hands of Blueprint Gaming, just like their fantastic Super Lucky Frog slot machine, where the Shisa (resembling a mix of Lion and Dog) guards the entrance to protect from evils and misfortune while you attempt to change your luck and you’ll also be in the presence of a white Maneki-neko (which is a cat figurine with its right paw up in the air) with this being a sign of good luck and wealth – the more the merrier, thanks! The Lion Festival slot machine contains 5 reels with 3 rows and 10 fixed paylines, with all visitors to the temple having to pay an entry fee of between 20p and £500 each time to have the privilege of the Maneki-nako and Shisa protecting you from bad luck, plus rather than only paying from left to right or right to left, Lion Festival will pay winning combinations in either way. Despite Blueprint Gaming stating that it has a paltry return to player percentage of 92.484%, there is an exciting Wild Respin feature, the Maneki-neko will transform to provide you with more ways to win big and you could even scoop the Jackpot King progressive – just don’t be whining about bad luck again if you’re lucky enough to win it! The reels are awash with gold and typical oriental items that you’d expect to see with a Wild Lion (Shisa) appearing on the second, third and fourth reels only and while there are no direct wins for it, its presence will trigger the Lion Respin feature that you can learn more about before. The other special symbol to be aware of is the Maneki-neko with all of these in view revealing a random symbol, so the more you find on the reels at once, bigger your wins will be. It’s a Geisha girl who is the most valuable of all with her welcoming you to the temple and lavishing you with up to 1000 coins for taking time out of your day. You will also find a golden symbol which represents luck and brings up to 100 coins, Yen coins on a red ribbon and a gold dish which are both wort up to 80 coins, a Taiko (drum) and a lantern which bring up to 50 coins, plus there are bags and boxes to fill with gold coins that are worth up to 25 coins. You’ll be roaring in celebration whenever the Wild Lion appears on the second, third or fourth reels as this activates the Lion Re-spin feature where the Wilds becoming Expanding Wilds to cover the whole reel and remain in place while the other reels respin. If you’re lucky enough to land more Lions whenever this happens the same thing will happen meaning that you could enjoy up to three respins – and with the three central reels covered in Wilds, you’d be extremely unlucky not to land a huge win! 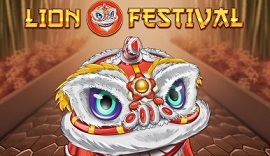 While you may be disappointed that there is no free spins mode or pick me game included in Lion Festival, the opportunity to be crowned a Jackpot King more than makes up for this. You’ll have the opportunity to scoop the jackpot playing for any stake with the aim being to land a Jackpot King symbol on each of the five reels before then having to land fifteen or more to enter the Wheel King section. Here you will be presented with a wheel with cash multiplier segments and three jackpot segments – the Regal, Royal and Jackpot King with you winning whatever the wheel lands on, fingers crossed it’s the big one! Lion Festival is pretty basic, even by Blueprint Gaming standards. The elegant design is typical of oriental-themed slots but we have seen the symbols that fill the reels many times before. Combine this with the lack of bonus features and there really isn’t much to roar about aside from the Lion Respin feature.